French president, Nicholas Sarkozy, helped launch the prototype of France’s new high speed train, Alstom’s AGV, at La Rochelle in France. The AGV (Automotrice Grande Vitesse) travels at speeds of 225 miles per hour and is powered by motors mounted under each carriage. Italian Railway officials were so impressed they placed an immediate order for a fleet of 25 AGV trains plus options for more. The AGV is particularly environmentally friendly, with 15% lower energy consumption than its main competitors. It also incorporates the latest ERTMS signalling systems and is able to run on all European lines. Alstom Transport’s sites in France at La Rochelle, Ornans, Tarbes, Le Creusot, Villeurbanne, Reichshoffen and in Italy at Bologna and Savigliano will all be involved in producing the AGV. Train length is variable ranging from 7 to 14 carriages, and from 250 and 650 seats. New technology substantially reduces maintenance costs. Says Patrick Kron, Chairman and Chief Executive Officer of Alstom, ‘We have developed this train using our own funds, a very unusual approach in the railway industry, because we understood that the market for very high speed rail travel was about to diversify. In order to maintain our leadership, we needed to broaden and update our range of products. Over the past 25 years, Alstom has sold more than 650 TGV trains which, the company says, have carried, in complete safety, nearly one and a half billion passengers over 2 billion kilometres. 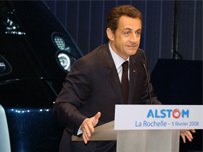 In 2004, Mr. Sarkozy, as finance minister, intervened to save Alstom. The French government partially privatised the company blocking a takeover by Germany’s Siemens, which the French feared would have dismantled Alstom. France continues to lead Europe in the development of high capacity, high speed, rail links. The TGV’s maximum speed is 320 km/h. However, a specially adjusted TGV set a new world record in April 2007 reaching a speed of 574.8 km/h.